Let’s talk about the nine alignments in Dungeons & Dragons™. Some people love the concept of alignment. Others hate it. Some will slave to it (and in turn try to enslave everyone around them to it), while others ignore it entirely. Regardless of how you feel about it, one thing is for certain: you probably love arguing about it. How do I know that? Because everyone loves arguing about it, that’s why! It’s a hotly debated topic! Heck, I don’t think I’m going too far as to say it’s probably the most hotly debated topic in the entire D&D community! Players and dungeon masters alike love to debate alignment, both the merit of it as a system and the subject of who which alignment applies to among famous fictional characters. It’s one of the biggest D&D memes on the internet, and that will likely never change. Why? Because the notion of a system of measurement that quantifies and judges a person by their personally decided moral and ethical boundaries is absurd. Sorry. Not absurd. Subjective. I meant to say subjective. Or maybe it’s both. It can be both. Frak. Can we start over? Before I started writing this article, I reread this three-year-old article on the subject of alignments by the Angry GM. I did this for two reasons: 1) because I think the Angry GM knows his stuff and his blog is as good a place as any to research a topic before I write about it, and 2) I don’t really want to repeat anything he had already spent considerable time dissecting (you know, take the road less traveled and all that junk). And do you know what the Angry GM had to say on the subject? Basically the same stuff I was going to say. Stuff like “[It’s] the most contentious [expletive] thing in the entire history of D&D” and “If you hate alignment, get rid of it. […] Don’t acknowledge it. It does nothing” and “Only the GM knows for sure who is lawful good and who is chaotic evil and so on. The players have to guess”, and “you, as the GM, are now the final authority on alignment. So, you have to know what the alignments are. [Because, especially if you’re going to judge people by them], you need to sit down and decide FOR YOURSELF what good and evil are and what law and chaos are”, yadda, yadda, expletive, yadda, and etc. The Angry GM made some really compelling arguments (as he usually does) both for and against the use of alignments, and ultimately he boiled down the whole issue to this: If you want to use it, use it. If you don’t want to use it, don’t (it’s completely unnecessary). But if you do decide to use it, make sure you have a clear understanding of what it is you are trying to use and make its context in your game world clear to your players. ‘Nuff said. Anyway, it was in rereading the Angry GM’s article that I realized he had already done the subject of alignments to death; there really wasn’t much else to say on the subject that hadn’t already been said. And since there’s nothing for me to add, I’ll just direct you to his article like the cop-out that I am (via the link above) and call it a day. That’s it. “Read the Angry GM’s article.” That’s all I have to say about alignments. My work is done. What more do you want from me? Go home. You can’t be serious… But that was just a silly title! It’s supposed to peak your interest so you click the link. It doesn’t really mean the article is going to compare the similarities between an adult man who dresses up as a bat on days that aren’t Halloween and an anthropomorphic frog who wrote a hit single about how it’s not easy being green. You don’t care? 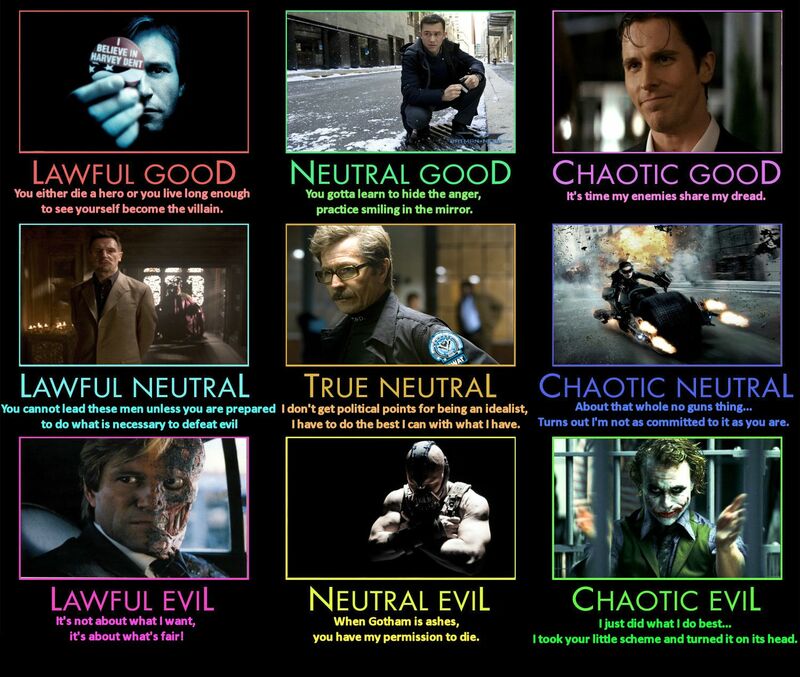 You still want to know what they have in common… Well, clearly you’re not on the lawful side of the alignment chart. Jeez. FINE! Have it your way. Let’s talk about Batman and alignments (and maybe, just maybe, what those two things have to do with a certain green amphibian who likes flies and pigs). Last week I got into a debate with a friend of mine about what alignment Batman would be. I know, I know, a dumb thing to debate. But he suckered me into it with a comparison between my own character and Batman, and who doesn’t love to be compared to Batman? Now, full disclosure, I’m a Marvel fan, DC isn’t really my bag, but even I can’t deny that a comparison between my D&D avatar and the caped crusader himself isn’t titillating. How could I not jump into it? Anyway, it was my friend’s assertion that Batman is Chaotic Good (an idea seemingly supported by the opinions of many on the internet). I vehemently disagreed, insisting that Batman was, in fact, Lawful Good. Cool. Like I said, alignment is subjective, so my friend is free to believe whatever he wants to believe, regardless of how wrong he might be. And make no mistake, there is a right and wrong answer here. You see, the part I left out about alignment being subjective is that it is subjective to the dungeon master, not the player. Oh, sure, the player can have their opinions about what the different alignments might mean, and they’d even be right if they decided to run a game of their own, but as long as they are playing it is their dungeon master who has the final say on what the nine alignments stand for in his or her game. So at this point, it is important to point out that my friend and I – let’s call him Jim – Jim and I were both players in the same game. Neither one of us were the dungeon master, and so neither one of us had the definitive answer as to what alignment Batman would be in our game. We were both just arguing our own opinions, and I normally don’t get into a heated debate when opinions are involved. But this argument was special, in that he was comparing my character (Naeris, a Lawful Neutral Elven Ranger) with Batman, a comic book character whom he maintained was Chaotic Good. In effect, he was calling out Naeris as being more chaotic than the alignment box on his character sheet led on, and thems are fighting words, Jimbo! 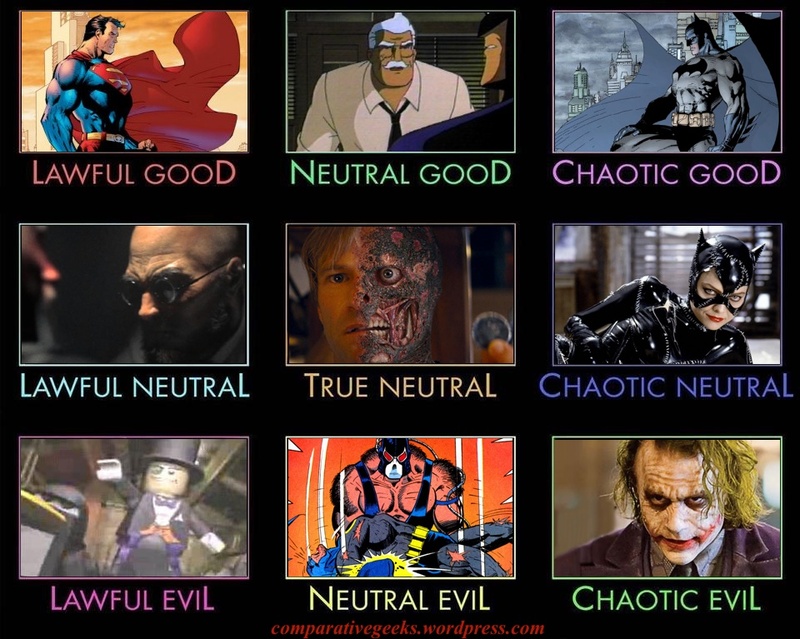 Now I had to defend not just my opinion that Batman was Lawful Good, but also my own depiction of a Lawful Neutral character within the game we were playing. It’s on! Batman is an interesting character to examine in the context of alignment because he’s been around for two-thirds of a century and has been written and portrayed by so many different writers and actors that you could probably find convincing evidence to support a Batman of any alignment. He’s a complex character living in a world where there is no right and wrong, just different shades of morally ambiguous gray. The context of the world he lives in is important, and we’ll get back to that later, but for now, let’s just look at the man. As described in the Player’s Handbook™, alignment “broadly describes [a typical creature’s] moral and personal attitudes” (pg. 122). The best way that I know to discern a person’s moral and personal attitudes is to examine their behaviour, or, in the words of Batman, “It’s not who I am underneath, but what I do that defines me.” Cool, so let’s look at Batman’s actions. First of all, he makes tremendous personal sacrifices for his quest to create a better Gotham. He puts himself in mortal peril every night fighting people who would kill him given the chance just to put them behind bars. He has no friends save his own butler (usually), and even sacrifices opportunities for developing relationships to keep his secret identity safe. He is burdened with the responsibility of doing what is necessary to save Gotham because in his mind he’s the only one that can, and you can see the weight it has on him. But what does all of this tell us about his alignment? Well, at this point in our debate, Jim said that it was obvious. Batman is a vigilante who acts outside the law in order to achieve the greater good of society, which makes him Chaotic Good. Case closed. Nuh-uh. Not getting off the hook that easy. 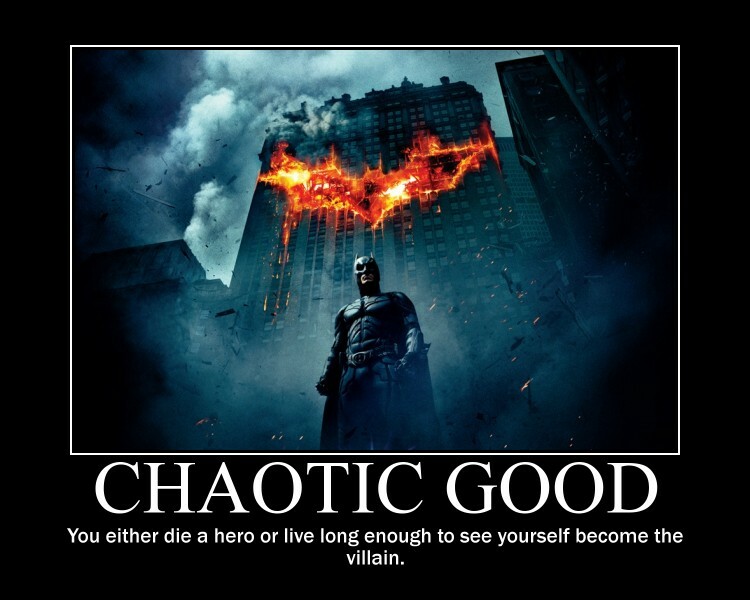 By that argument, almost ALL superheroes are Chaotic Good, which is certainly not true. Now, Jim, you yourself said that he is acting in the best interest of society, which sounds like a pretty lawful motivation to me. Okay, I’m going to say three things here and they are likely to charge a lot of people up, so brace yourself. LAWFUL DOES NOT MEAN LAW-ABIDING. LAWFUL DOES NOT MEAN HONEST. LAWFUL DOES NOT MEAN CARING OR NICE. Now hold your horses, I’m going to explain all three of those things in just a minute, but first, we need to talk about Batman. Yes, Batman breaks the law, and yes, he lies and hurts people criminals. All of this is true, but that has no bearing on his alignment. To find his alignment, context is important. We have to examine why he does these things, and the greater context of the world he lives in to better understand those actions. Hypothetical: if the government is Chaotic Evil in nature, and you are Lawful Good, is it not your responsibility to fight against the tyrannical government for the greater good of the society? Does the decision to fight the established tyrannical order make you as Chaotic as the tyrannical order you stand in opposition of? You see? It’s not so black and white of a question anymore, is it? Context is important. We need to understand the context of Batman’s actions and the context of his environment that prompts those actions to make a decision about him. And furthermore, we have to have some context as to what these alignments mean in order for us to measure them against Batman’s motivations. It’s clear we have a lot of work to do. This might have to be a two-parter! So Jim says: “Then just what does lawful mean, if not honest and law-abiding? Because I’ve only ever seen lawful used to describe characters with those traits.” And that’s fair. It’s an easy assumption to make. After all, characters who are both honest and law-abiding are always lawful, but the reverse is not always true. Webster defines lawful as being in harmony with the law; or being constituted, authorized, or established by law. Webster even says that law-abiding means a lawful citizen (note, however, that it doesn’t say that a lawful citizen means a law-abiding one). Now, there’s no question that Batman doesn’t fit those definitions (he is neither in harmony with the law, nor is he a recognized lawful institution), but we are not debating the definition of the word lawful according to the English dictionary. We are debating the meaning of the lawful alignment in the many worlds of Dungeons & Dragons. An important distinction that a lot of people forget to make. In the English dictionary, lawful is a behavioural attitude and personality trait, but in D&D, the lawful alignment is a cosmic force in the multiverse. Yes, alignment can be attributed to almost any creature in the many D&D worlds where it functions as a “right and wrong” thermometer, but it is also so much more than that. It, along with the other eight alignments, govern the behaviours of otherworldly beings, like Celestials, Devils, and Gods. Now, mortals like Humans and Dwarves have mutable alignments, determined at any given point in time by the history of their actions and values up to now, but that’s not the case for otherworldly beings. For creatures like Angels and Demons, alignment is a fundamental part of what they are, to the point where if a Fiend could stop being evil, it would cease to be a Fiend. A Chaotic Good Halfling Bard could over time see the error of his ways and become less chaotic, but a Fiend could no more change their alignment than a Halfling could change their size. This is important to understand because it helps you to realize that alignments in D&D are more than just your attitudes and values as a character, they are also powerful cosmic forces which govern entire realms outside of the material world. It’s important to understand that while there are nine alignments in D&D, there are only three lawful alignments. In theory, regardless of where you fit on the moral scale of good and evil, all individuals on the lawful side of the society and order debate share some things in common. It might be hard to grasp, but in theory, you could see a pair of lawful good and lawful evil characters siding against a chaotic good character if the circumstances were right. Now, more likely a lawful good and chaotic good would team up against a lawful evil, but the notion isn’t impossible. Where lawful good and lawful evil differs is only on what is morally right and wrong so they could have more in common than you might initially think. So let’s have a look at what the Player’s Handbook has to say about the lawful alignments, shall we? Lawful good creatures can be counted on to do the right thing as expected by society. Gold dragons, paladins, and most dwarves are lawful good. Lawful neutral individuals act in accordance with law, tradition, or personal codes. Many monks and some wizards are lawful neutral. Lawful evil creatures methodically take what they want, within the limits of a code of tradition, loyalty, or order. Devils, blue dragons, and hobgoblins are lawful evil. That’s not a lot to go on. The designers probably left it vague on purpose so that you could take from it whatever meaning you wanted to ascribe, but we’re not interested in personal opinions. 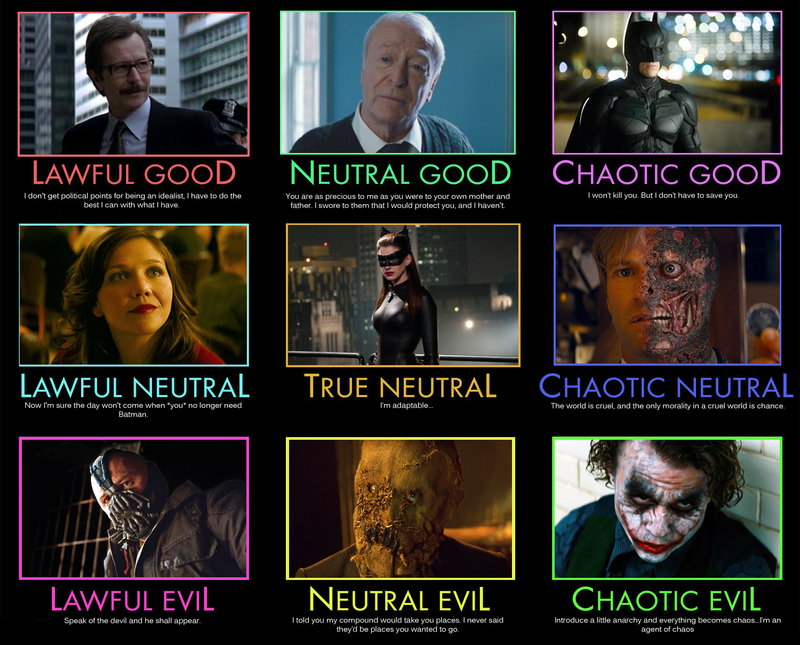 We’re trying to get to the bottom of a very important issue: Batman’s alignment. So let’s dig deeper. There are nine different alignments in D&D. Those nine are created from all the possible combinations where each alignment could meet along two sliding scales. The sliding part is important because it reminds us that no single act determines a person’s place on the alignment chart, it merely slides them one step closer down one of nine different possible roads. Those scales are good versus evil, and law versus chaos. It’s important to understand that each scale is unique and separate. Where you place on one scale has no impact on where you place on the other, they are each measuring different things. 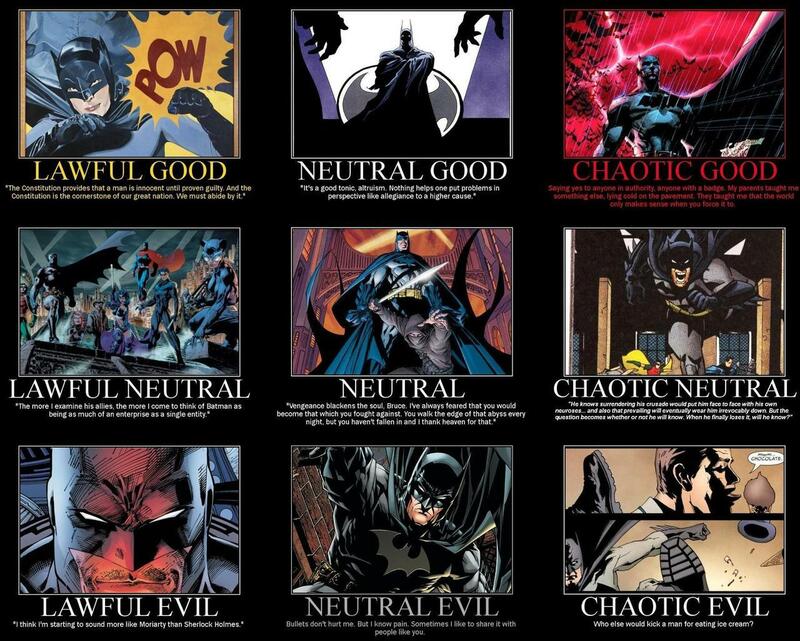 It is in measuring your placement on both that you find which of the nine alignments best describes you (or, in our case, Batman). So what do the two scales measure? What are their inherent differences? Most people have a solid understanding of the good and evil scale, but the law and chaos one is often more ambiguous. The Player’s Handbook describes the good and evil factor as being one’s attitudes towards morality (good, evil, or neutral), and the law and chaos factor as being one’s attitudes towards society and order (lawful, chaotic, or neutral). Note that the description of the law versus chaos scale does not say it reflects one’s attitudes towards the word of law according to the established government or ruling party (king, emperor, republic, what have you). This is important because one’s attitudes towards society and order might place you completely at odds with the word of law or the ruling party. Doing the right thing as constituted by society and order might mean opposing a tyrant king who rules his people with an iron fist. Doing the right thing as expected by society doesn’t mean going along with what society is doing either, that would be doing what is the popular thing as expected by society, not the right thing as expected by them. Let’s have an example. Say you’re a kid in school and you are witnessing another kid being bullied, and everyone around is laughing at the victim and encouraging the bully. What’s the right thing to do here? You know what the right thing to do is according to your own internal moral debate (good versus evil), but what is the socially acceptable (law versus chaos) right thing to do for the betterment of society and order? If you said the answer is the same – stand up to the bully – you are correct. The fact that the immediate local society (the onlookers) prefer to take part in the chaos that the bully is inciting doesn’t change the fact that the act of bullying is inherently a chaotic one. Standing in defense of the victim is also standing in defense of society and order in the greater cosmological sense. Now in some cases, what is morally right and what is right as defined by society and order are the same thing, but in other cases, they might find themselves at odds. What if the right thing to do, morally speaking, is the wrong thing to do according to society, or vice verse? Then you have a conflict between yourself and society. What do you do then? It’s not an easy question to answer. In fact, it’s a question that some people of the same alignment might even disagree on. Personally, I like to think of an individual’s attitudes towards good, evil, law, and chaos to be their moral and ethical compasses, and whether or not they listen to their moral and ethical compasses determines where they place on the alignment scales. Let me explain. Ethics and morals both relate to “right” and “wrong” conduct. While they are often used interchangeably, they do not mean the same thing. Morals relate to your own internal principles of what constitutes right and wrong (what you believe), whereas ethics refer to a code of conduct provided by an external source (what society believes, what a religious order believes, what the government believes, etc). This is why ethical dilemmas are much murkier than moral ones because it requires correct interpretation by a third party of the external source’s beliefs in order to get it right. Think of them as both internal (morals), and external (ethics) definitions of right and wrong. Similar, but different. It’s the simplest way I can think of to describe the difference between the good/evil and lawful/chaotic alignment scales. So by these definitions, if a moral quandary in D&D is one that relates to the good and evil alignment scales, then an ethical quandary is one that relates to law and chaos. This is the biggest misconception I encounter when discussing the subject of lawful and chaotic alignments. People get hung up on that word, lawful, and frequently think it means someone who unilaterally respects the word of law and whatever it entails. No, no, no. While it very well might mean your character is a law-abiding citizen (especially if you respect the source of the law and consider it just), it does not mean that you consider the word of law to be your bible, something that should be always followed without question. It means that you behave with a code of ethics that is the principle determining factor in your decisions as to what is right and what is wrong. It means the little angel on your shoulder is giving you advice that benefits all of society, not just you, and the little devil on your other shoulder is giving you advice that benefits all of society as long as it benefits you first. Nothing about that has anything to do with following the word of law, or always being honest, or any of the other dumb stereotypes I always see applied to lawful good characters. Heck, you could even make a case for saying Robin Hood is lawful because what he is doing (stealing from the rich to give to the poor) is for the good of society at his own expense (he’s definitely not lawful, but you could make a case for it). Perhaps the word lawful is a poor choice on Wizards’ part since it often fails to accurately portray what it is they intend it to mean. Maybe we should switch it to ethical, then we’d have ethical good and ethical evil characters on the opposite ends of the chaotic spectrum. Alas, that is not likely to change because the concepts of law and chaos have been around since the very first edition of D&D, and I can hardly fault Wizards for a decision made since before they acquired it from TSR Inc.
A lawful good character is one who has both a strong moral compass and an equally strong code of ethical conduct. This individual is one who tiptoes the line between morals and ethics and always tries to do the right thing, both in terms of what he or she believes is the morally correct thing to do, and what he or she believes would best benefit society. This person holds themselves to the highest of standards, and stubbornly tries never to compromise their lofty ideals. In rare moments where they would have to decide between a morally correct and ethically correct course of action, they would always weigh each such circumstance carefully, and try their best to choose the lesser of two evils. A neutral good character is one who has a strong moral compass that guides their every decision. This individual has an understanding of what society expects of them, and probably even has a code of ethical conduct, but would never allow a trivial thing like ethics stand in their way of acting on what they know in their heart to be right and wrong. A chaotic good character, like the first two, also has a strong moral compass. Where the chaotic individual differs is they have no code of ethical conduct whatsoever. Unlike the neutral good character who is happy to ignore their ethical compass if the cause is just, a chaotic good character simply doesn’t have one. Oh, they probably understand what society expects, and can even fake it if they have to, but make no mistake: a chaotic character believes that society and order are illusions maintained by the fearful masses who need ethically imposed restrictions so as to feel safe from anarchy. The chaotic good character believes in following their own rules for what constitutes right and wrong and would never let someone else try to tell them to do otherwise. A lawful neutral character is one who believes in society and order and follows a strong code of ethical conduct to help them achieve their vision of a safer, more prosperous world. Like the neutral good character, this individual has both a moral and ethical compass, but where they differ is that the lawful neutral character places the needs of society above the needs of the individual. He or she will always make the most ethically correct choice in any circumstance, even if it means going into morally gray territory to do so. Lawful neutral characters are often the most uncompromising in their ideals because they behave the way they do not because it is what they want, but because they believe they are burdened by responsibility to act in defense of their vision for a more ordered society. A neutral character (sometimes called true neutral), is one who abstains from choosing sides in either the moral or ethical debates. This individual has an understanding of both but just doesn’t care about either of them. They’d rather just be left out of the wars between good, evil, law, and chaos. They find them to be a waste of time, and, quite frankly, insane. A chaotic neutral character is one who lacks any kind of code of ethics, and who has a moral compass but chooses to ignore it. Like the chaotic good character, this individual thinks the ideals of society and order are made-up nonsense to pressure people into not stealing stuff (“Garbage, I’ll steal if I wanna,” they might even say). Where the chaotic good and chaotic neutral character find themselves at odds is that the chaotic neutral character doesn’t really care about doing the morally right thing. Don’t get me wrong, they know what it is, and they might even do it if it benefited them! But probably not otherwise. The chaotic neutral character has found the off-switch for their moral compass long ago, and actively chose to ignore it most likely because life proved to be easier without it. Now we’re getting to the bottom of the barrel! A lawful evil character is one who believes (perhaps mistakenly? perhaps not?) that they and they alone are burdened with the immense responsibility of needing to rule. This character has a strong code of ethics, like the other two lawful alignments, but where they differ is perhaps that they often believe that only they have a code of ethics strong enough to do what needs to be done for the good of society. It’s important to note that an evil character doesn’t have a moral compass to slow them down (benefit? drawback? you decide), and a lawful evil character might even see morals as an obstacle that stands in the way of achieving a perfectly ordered and ethically sound society. On the other hand, the neutral evil character has an understanding of ethics and probably thinks rules and regulations should apply to society at large, just perhaps not to them. Rules? Regulations? Mere tools that a neutral evil character can use against others but ignore themselves. This character has no moral compass to speak of and behaves in whatever manner suits them best to achieve their goals. They likely wouldn’t want to see the destruction of society, but only because then they’d have no more playground to take advantage of. And last, but not least, a chaotic evil character is one who lacks all morals and ethics whatsoever. Actually, they take it one step further, believing that morals and ethics are constructs that should be destroyed. They don’t fit in with society at all, and are not content to merely exist outside of it but would rather see the whole world burn. That’s what you get when you look at alignments from the perspective that good versus evil is a moral debate, and law versus chaos is an ethical debate. But that’s my opinion. It only matters to you if you agree with it. If you don’t, then do your own thing. Seriously. The rules are there to be interpreted however you want to interpret them. You can redefine the alignments, create new alignments, or even toss alignments out the window. It doesn’t matter. What matters is that you use (or don’t use) the system in whatever way is going to be the most fun for you and your friends who play games together. That’s all. ‘Nuff said. So after all of that, what is Batman’s alignment?! No, seriously. Ask your DM. Because only they know the answer. 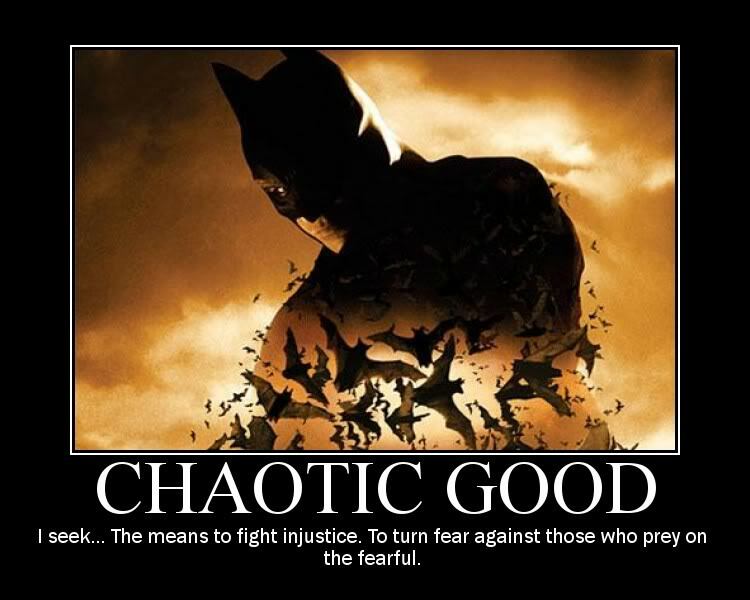 I believe (and quite stubbornly maintain) that Batman is lawful good (and if you haven’t gotten the hint yet, that’s what he has in common with Kermit the Frog) because, as I’ve spent this entire article arguing, a lawful character is one with a strong code of ethical conduct, and a good character is one who can’t ignore what their heart tells them is right and wrong. Batman is both of those things. Sure, he isn’t the most law-abiding citizen, and yeah, he’ll lie to your face and maybe break your legs if you get in his way, but deep down Batman just wants to do the right thing by his rules and by society’s rules. The only reason he doesn’t is that the incredibly corrupt society of Gotham City doesn’t abide by its own rules of ethics, and he’s the only one willing to do what must be done to fix it. But what do I know? That’s just my opinion. And here’s the thing about alignment, it is subjective. In my game, it means what I say it means. In Jim’s game, it probably means something else. In your game, it will mean something else still. The point of all this isn’t to get to the bottom of what Batman’s alignment is, it’s to show you how asking your DM to justify themselves in their assertion of what Batman’s alignment is will help you to better understand the role that alignment plays in your game. And that’s what’s going to make your D&D game more fun. Not arguing about the alignment of someone who runs around in his underwear dressed like a bat. Well, okay, maybe that’s fun too. And speaking of fun, here’s what you get when you search Batman versus Kermit in Google. The internet is weird. You’re welcome. Phew. 5,000+ words. My longest article yet. And we’re still not done! How can this be? What can I say, alignment is a big topic. Check back next week for part 2, where I beat the Marvel Cinematic Universe over the head with D&D’s alignment system! Why? More like, why not, am I right?! Eh? Eh? …. Ah nevermind. MAP – Most Adorable Projects!